Hip Hops: Amensty And Andray Blatche: Waiting For A Trade? 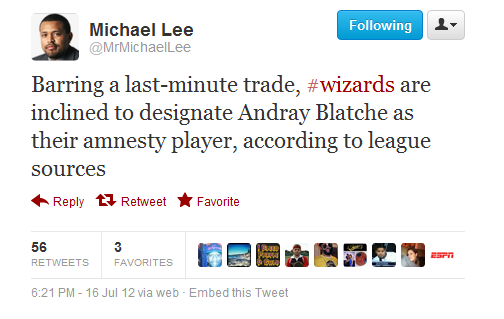 Amensty And Andray Blatche: Waiting For A Trade? Tuesday, July 17th, 2012. That is the final day for NBA teams to release a player and his salary from their books under the Collective Bargaining Agreement. That day is approaching. Andray Blatche has been a member of the Washington Wizards for his entire seven year career. From being shot, to finding a special surprise from Gilbert Arenas in his shoe, to telling Flip Saunders that he refused to go back into a game, the self-proclaimed 7-Day Dray is the final remaining piece of a time of organizational disaster. The relationship between the Washington Wizards and Andray Blatche had gotten so bad that they sent the 2011-12 captain home with pay under the guise that he needed to "get in shape". The organization clearly does not care for Blatche and for a majority of fans that feeling extends all the way to hatred. That is why the date of Tuesday, July 17th is so important. It is the organization's chance to rid themselves of the Gilbert Arenas gun massacre. So why hasn't it happened yet? After the end of the NBA lockout in 2011, the new Collective Bargaining Agreement created a special 'Amnesty Clause' that allowed a team to have a one time chance to dump a player and his salary over the course of the CBA. 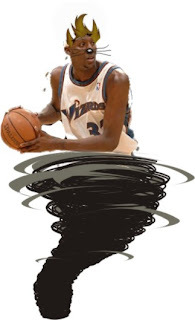 According to NBA journalists at the time, it was jokingly reffered to as the "Rashard Lewis Clause" or the "Gilbert Arenas Clause" based on the ridiculousness of those two player's salaries. That brings us to 2012. Rashard Lewis and his insane salary are gone and all the focus has shifted to Andray Blatche. The team doesn't want him. The fans don't want him. And because of those reasons he probably doesn't want to be in DC. 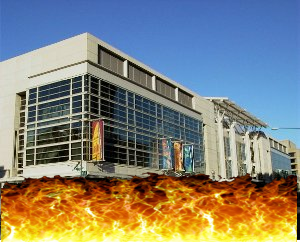 So why haven't the Wizards fired away? Saving it for 2020? Is that even possible? What appears to be happening is the Wizards are holding out til the last minute, working hard on getting a trade put together. Another player, a washing machine, a ham sandwich. 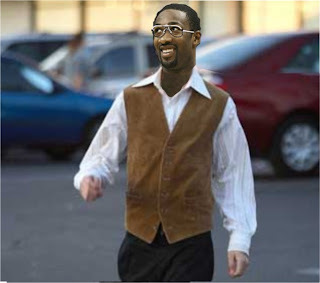 Anything for a player who could be described as "unwanted" in NBA circles. But if they can't get that deal done, which appears likely, then what do they do? What the Wizards should do is amnesty him, pay him his remaining contract, and allow him to move on. Perhaps use that money to get someone who will contribute. Fans have crushed Blatche's spirits over the last few years and he deserves a chance to start over. What has been discussed is the team paying him to sit at home like they did at the end of last season. This basically crushes the career of Andray Blatche, puts him out of the game for a year, and all but ends his NBA days.